Buckie Thistle and the AFC Heritage Trust today announced the rediscovery and restoration of a very rare football poster from 1907. 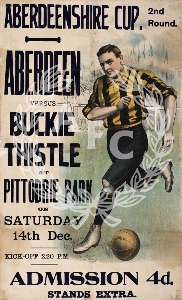 The poster was used in December of that year to advertise the Aberdeenshire Cup fixture to be played at Pittodrie Park between the two clubs. The poster was tucked away at Victoria Park in recent years until it was brought to the attention of the AFC Heritage Trust who approached Buckie and undertook to have the poster, which was not in great condition, restored. It is believed that the design of the poster was produced by famous London artist Frank Dadd, still well known for his many classic advertising posters and in particular for many from the First World War. It was printed by Petty & Sons of Leeds and Reading, now a part of the Polestar-Petty Group. The work of renewal was painstakingly carried out by the Scottish Conservation Studio near Edinburgh. This involved bathing the poster in special fluids to remove acids and stains that had accumulated over the years. Many small pieces of the poster had to be captured during this process and carefully placed - in jigsaw puzzle style - in their positions on the poster as it was reassembled in one piece. The final stage was to mount the restored poster in an acid free mount ready for framing. That job was completed by the Belvidere Gallery in Aberdeen and the poster is now protected behind an acid free, anti-ultra violet, acrylic pane. For the time being the original poster will be displayed in the Black and Gold Lounge at Pittodrie where it will sit alongside other material from the early 1900s period. Eventually, because of the need to keep this important object in the correct atmospheric conditions it is hoped that the original will be put in the care of a specialist Gallery that has the appropriate storage conditions and a facsimile print will be displayed in its place. Buckie Thistle will also have one of these limited edition prints and a limited number of A3 size prints will be offered through the AFC Club Shop for sale to help recover the costs of restoration and preservation. A spokesman for AFC Heritage said: "This has been a lengthy process and we are grateful to Buckie Thistle for allowing the poster to come back into the public gaze. We have been told by experts at the Scottish Football Museum at Hampden Park that this is a very rare and unusual item and that they have not seen one before. Perhaps now that we have publicised the piece someone will be able to tell us otherwise, we'd certainly be glad to have more information." For Buckie Thistle, Chairman Garry Farquhar observed "It is a great thing to see such an unusual piece of football history returned to life more than 100 years after it first saw the light of day. We are delighted to work hand in hand with the AFC Heritage Trust on this and look forward to an ongoing partnership whilst a small range of merchandise is produced around the image to help both the Trust and ourselves. We hope that fans of both clubs will get enjoyment from the poster and perhaps owning a beautifully produced copy." Footnote: The tie, which was played off on Saturday 14th December 1907, ended in a 3-0 win for the Black and Golds' Reserve team. The match kicked-off at the unusual time of 2:20 p.m. to allow it to be played in daylight. An A3 sized art quality numbered limited edition of the poster is available through the Aberdeen FC Club Shop at Pittodrie. Every print comes in an archival acid free packet with a certificate of authenticity.